Candidates who are Searching Jobs In Assam State, Here is s job opportunity for you. 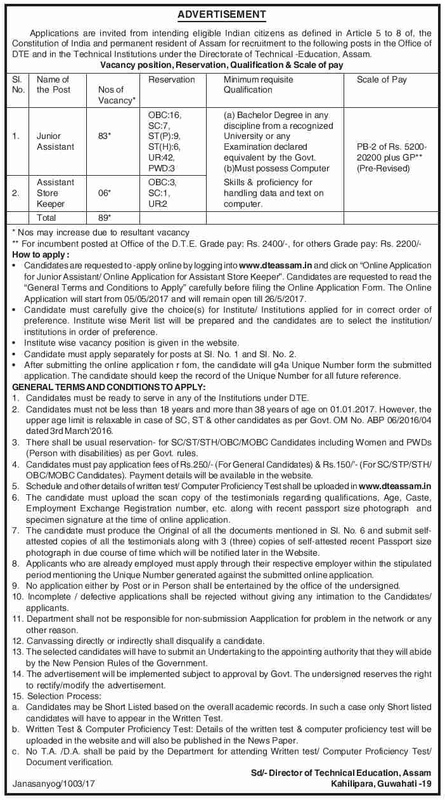 Directorate of Technical Education has released notification of recruiting candidates on 89 Junior Assistant & Assistant Storekeeper Jobs. Applicants who are Interested in DTE Assam Recruitment 2017 can fill online form here before the last date. 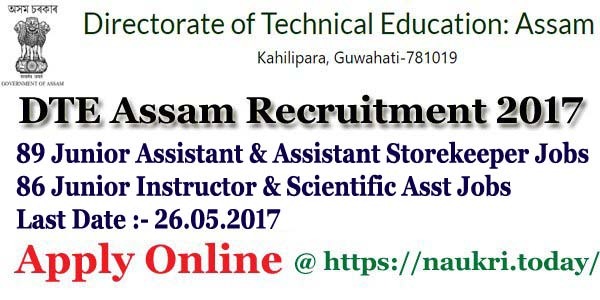 Closing date for submit online for for Assam STE Vacancy is 26.05.2017. Assam Directorate of Technical Education is inviting online application for those candidates who are waiting for DTE Assam Jobs 2017. There are 89 Jr Assistant & Store Keeper Vacancy. This is great opportunity for those candidates who are looking For Assam DTE Recruitment 2017. Online registration for Assam Technical Institute Vacancy will started from 05.05.2017. 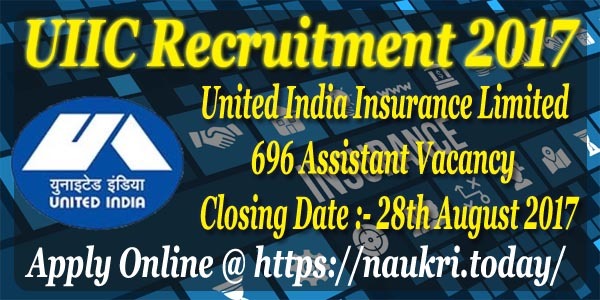 For more details like Eligibility Criteria & Other you can check from given below details. Fresh Update (05.05.2017) : Candidates are inform that the Online registration for 89 jr Assistant & Storekeeper Jobs has been started. candidates who are eligible can fill online form here, link for applying DTE Assam recruitment Online form is mention below. How I Fill Online Application Form For DTE Assam Recruitment 2017/ Assam DTE jobs @ dteassam.in ? What is the Eligibility Criteria For DTE Assam Recruitment 2017/ Assam Engineering Colleges Junior Instructor Jobs ? How I Fill online Form for DTE Assam Recruitment 2017 @ dteassam.in ? Education Qualification For DTE Assam Assistant Recruitment 2017 : Candidates should have completed Bachelor’s Degree in respective Trade or equivalent from any recognized University for DTE Assam Jobs 2017. Candidates must have possess Computer Skills & Proficiency for Handling Data and Text on computer. DTE Assam Storekeeper Jobs 2017 Age Limit : Age of the candidates for DTE Assam Recruitment 2017 should be in between 18 years to 38 years as on 01.01.2017. Relaxation in age for Assam DTE Recruitment 2017 will applicable only for SC/ST/OBC/MOBC/STH category candidates. DTE Assam Recruitment 2017 Application Fee : General category candidates must paid Rs. 250./- for filling online form for DTE Assam Assistant Jobs 2017. Other category candidates need to pay Rs,. 150./- for applying online form for DTE Assam Vacancy 2017. Pay Scale For Assam DTE Junior Assistant Jobs 2017 : Candidates will paid pay band Rs. 5,200/- to 20,200/- with grade pay Rs. 2,400/- for DTE Assam vacancy 2017. Assam DTE Vacancy 2017 Selection Method : Selection of the candidates for DTE Assam Recruitment 2017 will based on the given fa tor. Schedule of Examination will issued soon on official website. You can check more details about Assam DTE Recruitment Like Exam schedule & syllabus etc. from here. Keep in touch with this page for future updates. Candidates first of all visit to the official website www.dteassam.in. Now click on official DTE Assam Junior Assistant Jobs Notification link. Read all the information from notification without any mistake. If you are eligible for Assam DTE Jobs then click on online Application Form link. Make all the required information in form properly. Now deposit application fee & Recheck all details before submission. Conclusion: DTE Assam Recruitment 2017 For 89 Junior Assistant & assistant Storekeeper Jobs. candidates can fill online form for DTE Assam Storekeeper recruitment on or before the last date 26.05.2017. Dear Applicants, Assam Directorate of Technical Education has released notification of 86 Junior Instructor and Scientific Assistant Vacancy in State Engineering Colleges & Polytechnics. Candidates who are interested in DTE Assam Recruitment 2017 can fill application form through online mode. Applicants can fill online form against DTE Assam Jobs on or before the last date 05th May 2017. DTE Assam is inviting online application form recruitment candidates on 86 Junior Instructor & Scientific Assistant Jobs. Online registration for DTE Assam vacancy has been started from 05.04.2017. Candidates have a chance to fill online form who are waiting for Jobs in Assam State. For more information about Assam State engineering Colleges Vacancy like Age Limit, Application Fee etc. you can check given below details. For DTE Assam JA Jobs : Candidates should have passed HSLC or TSLC with having ITI or equivalent certificate for DTE Assam jobs 2017. Candidates must have 05 years work experience from Govt. Recognized Organization for Junior Instructor Jobs in Directorate of Technical Education Assam. For Scientific Assistant Jobs : Applicants should have done Degree in Science with Physics, Chemistry and Math as Subjects from any recognized University/ Institute. Assam DTE Vacancy 2017 Age limit : Minimum age of the candidates for DTE Assam recruitment 2017 should be 18 years & upper age must be 28 years as on 01.01.2017. Age relaxation is applicable up to 05 years for SC/ST category for Directorate of Technical Education Assam Recruitment 2017. For Junior Instructor Post : Selected candidates will paid Rs. 5,200/- to 20,200/- with grade pay Rs. 2,700/- for DTE Assam JA Recruitment 2017. Scientific Assistant Post : Rs. 5,200/- to 20,200/- with grade pay Rs. 3,000/- will paid for Scientific Assistant Jobs In Assam DTE. Assam Engineering College Instructor Jobs Application Fee : There is no need to pay any a[plication fee for filling up online form for DTE Assam vacancy. Selection Method For Assam DTE Recruitment 2017 : Selection of the candidates for DTE Assam Recruitment 2017 will made on the basis of Written test/ Oral Interview. For more details about Exam Process & General Instruction you should read out DTE Assam Notification, which is mention below. First of all candidates log on to the official website www.dteassam.in. Now click on official DTE Assam Junior Instructor Jobs Notification 2017. If you are eligible then click on Applying Online application for respective Post. Upload all required document in online form. Take print out of application form form future use. DTE Assam Recruitment 2017 for 86 Junior Instructor & Scientific Assistant jobs. Candidates can fill online application for DTE Assam Vacancy on or before the last date 05.05.2017.